This project is a collaboration between Dr Martin Stokes at Plymouth, SUERC (University of Glasgow), the University of Porto (Portugal) and Universidade Cabo Verde. Cape Verde are a series of volcanic islands in the Atlantic Ocean that are offshore west Africa and close to the Equator. Their climate is very arid and they are considered an offshore extension of the Sahara Desert. This project is examining how changes in the Saharan Desert climate over hundreds of thousands of years have generated large floods that have eroded the volcanic craters and have deposited fans of sediment around their margins. We are using field based flood reconstruction methods and cosmogenic exposure dating of flood boulder deposits to assess the size and timing of large flood events that have built the alluvial fans. Preliminary results suggest that the alluvial fans are responding to African Humid Periods, periods of extreme rainfall that have affected the Sahara Desert for periods of ~5,000 years, every 20,000 years (axial precession). The floods are causing avulsions on the surfaces of large alluvial fans, switching flood water sedimentation to different areas over the last 100,000 years. Deep channelized erosion through some alluvial fans have revealed lava flows and pumice interbedded with alluvial fan sediments. 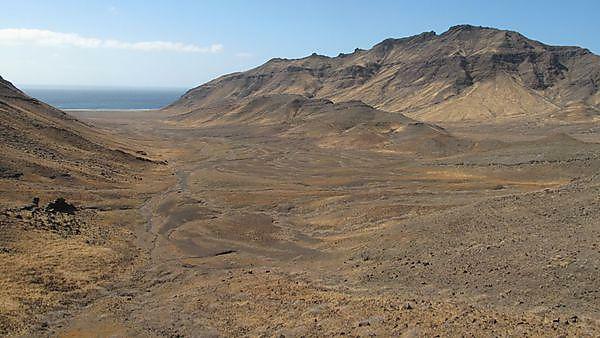 These volcanic products have buried and fossilised old alluvial fan surfaces giving an opportunity to examine climate-related landscape changes over hundreds of thousands of years. The research has benefitted from recent fieldwork funding from the British Society for Geomorphology and the use of cutting edge satellite data from the TanDEM-X satellite mission operated by the German Aerospace Centre (DLR).